1. Quality time with my girl. Before baby boy's arrival I (should) have a lovely 6 weeks with just me and my girl. I have been feeling so guilty because when I get home from work I have been just too exhausted do little things like playing together. I plan on doing lots of baking, craft activities, trips to the park, library, soft play (if I can stomach it) and the beach. I want to try and make this summer special as it will be the last as a family of three. 2. Home cooking. Again, with work tiring me out in the evenings I have found cooking meals from scratch a rareity. I love cooking, but I hate to rush it. It will be nice to actually organise our weekly meals and get on top of the food budget and what we're actually putting into our bodies. We haven't been eating particularly healthily the last few weeks! 3. Preparing for babies arrival. I feel like I have started the nesting stage, but again I simply don't have enough time at the moment to fully immerse myself with this urge! In the back of my mind I just keep thinking, maternity leave is just around the corner so it can wait till then. But I'm actually finding that hard to do... I often go to bed and lay there for hours thinking how I need to sort babies clothes, clean the bathroom and put together babies room. All pretty ridiculous in the grand scheme of things, but I guess that's pregnancy hormones for you. 4. Slower pace of life. At the moment I feel like I'm constantly rushing around, at work, home and even with my blog everything seems to be going at 100mph and I just can't keep up. It's so frustrating. You may have seen on social media I'm constantly wanting more hours in the day, really I just wish my time was more evenly spread! I'm looking forward to not having to worry about work and put more focus on my family and this little space of the web. 5. Last and certainly by no means least. I'm looking forward to meeting my baby boy at the beginning of September. I'm looking forward to baby snuggles, those afternoons where baby sleeps soundly on your chest. I'm looking forward to Darcie being a big sister and seeing her blossom in her new role. I'm looking forward to Jamie being a dad of two, he is the best daddy to Darcie I could of ever wished for and I know he has even more love to give for his boy. Bizarrely, I'm even looking forward to those late night feeds. Where all is quite and you're having those sleepy cuddles. I'm looking forward to a new chapter, probably a challenging chapter but an exciting one nonetheless. 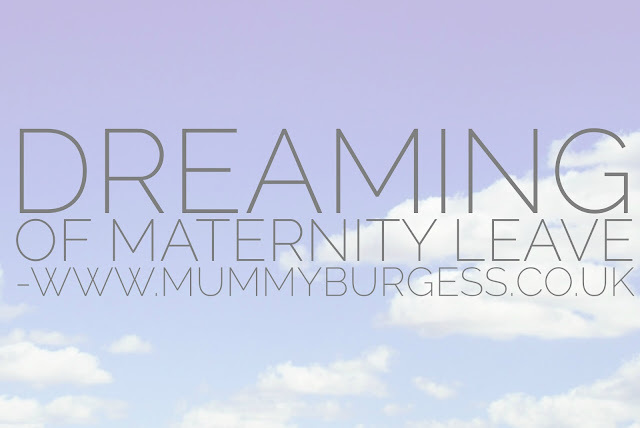 What were the things you look forward to when about to go on maternity leave?